A group shot we had been waiting to get for the longest time - weather was perfect and it just had to happen. The result & Sigma Rho are clearly perfection! Cliché as it may be to ask, but where did March, April and half of May go? Perhaps I am speaking for myself, but these last few months have blazed by and it is hard to believe that finals are over and that most of us will be on our way home within the next upcoming days. Surely many of you will most likely be seeing us to assist with the ever favorite move out process – something my own family always dreads driving several hours for – or maybe a few of you will be joining to recognize your Beta in the university’s forthcoming graduation ceremonies. Whichever the case, the conclusion of the academic year will indefinitely see most of us temporarily parting ways for summer jobs, internships or just an overall break from academia. Until this happens, however, we have at the time of writing roughly 72 more hours left together and I have my last remaining newsletter to present to you. That is, a combined update for March, April and (half of) May. Firstly, I am pleased to make the announcement that after careful consideration, a successor has been selected who will from this point on officially serve as Sigma Rho’s next Public Relations Chair: Kyle Tebelman ’18. 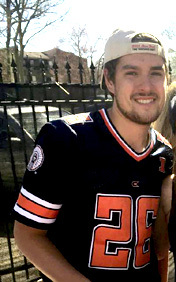 Hailing from New Lenox, Illinois, Kyle is a Finance major in Illinois’ College of Business as well as a member of Illinois’ club golf team. Additionally, he has served on the Alumni Relations committee since his initiation this past February. 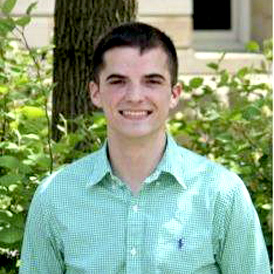 When asked why assuming the position personally appealed to him, Kyle stated that he wanted “to be able to connect the active members, alums and family members with the Chapter” and effectively have a hand in "creating and sharing the experiences together.” And when looking to the future and what he plans to do with the position, Kyle excitedly states that he will continue to “connect current Sigma Rhos to alums through an array of stories and events” as well as “entertain the newsletter readers and update them of all the great events Sigma Rho runs.” Admittedly, when VP of Communications Aaron Reinsbach ’17 reminded me that I was soon to be placed on Sigma Rho’s alumni list just weeks ago, I then realized that this position I have established and enjoyed so much since our recolonization was coming to a conclusion. Passing the position on to only its second overseer has been both bittersweet and exciting and I greatly look forward to seeing what my Sigma Rho Brothers are up to during the next academic year and the work that Kyle will undertake. So please welcome him with all your best; he will without a doubt do an excellent job at serving you! with the next coming academic year. Apart from the introduction of your next PR Rep, Sigma Rho is also proud to announce that we are the campus wide victors of Alpha Phi’s “King of Hearts” pageant! Benefitting the Alpha Phi Foundation which raises money for women’s cardiac care, the pageant entailed four components: Ryan Walton ’17 wearing creative outfits highlighting our House letters/symbol and a dance with Alpha Phi members for Greek spirit; a swimsuit showcase and pick-up line bid by Luke Mittelstaedt ’18 and Yannis Zigras ‘16 to “sweep the ladies off their feet” and demonstrate our charm; Ali Abdou ’16, Matt Heffernan ’17 and Tommy Laabs ’16 performing a talent act for entertainment; and Micah Lange ’18 in a formal wear presentation to impress the crowd with our dapper looks. In the end, Alpha Phi couldn’t resist Beta’s creativity, charm, flair or our ability to clean up better than the rest and we were crowned winners with a nicely made winning cup compliments of the ladies themselves. Cup now permanent house memorabilia and knowledge of directly assisting with raising several thousand dollars for the foundation, we are very proud and honored to have had a chance to participate. Who knows, maybe next year we’ll even outdo ourselves! 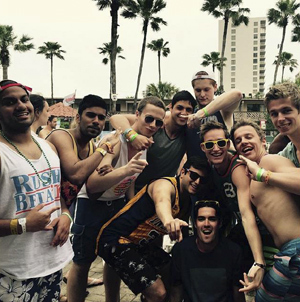 With the pageant won and midterm exams completed, Spring Break was now in full swing and South Padre Island, Texas was the destination of choice for many here at Sigma Rho. 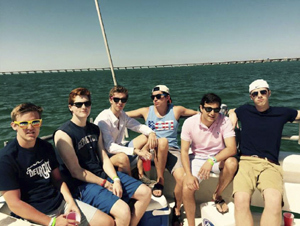 1,300+ miles, 20+ straight hours of driving and multi-state food stops later, thirty brothers descended upon upscale condo accommodations (arranged by JR Domalewski ’16) that were mere steps from the beach. Hot, sunny weather complemented the cool Gulf of Mexico waters where all enjoyed taking in the Texas sun and meeting dozens of individuals from around the country, including some fellow Betas from the University of Missouri. Further enjoying the relaxation, several of us even charted an ocean cruise for the afternoon as well. All in all, Spring Break 2015 was a success and plans are already underway for selecting a location come next spring. And now that the house has over 90 men with more currently on their way to initiation, it will make for an even better round two. "King of Alpha Phi's Hearts." honest: this moment just made for an epic photo that had to be included. and big Texas sun with a charter boat trip. 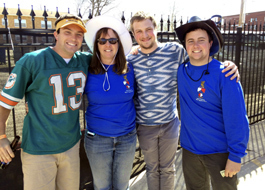 Following spring break adventures, the next event 202 E. Daniel played host to one of the most important events of the year: April 10-12 Mom’s weekend! 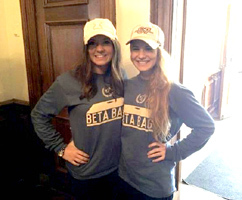 In addition to the university offered craft fair, brunch and musical performance events, we Betas wanted our Mom’s to get a hands-on experience with one of our favorite pastimes – a bags tournament. Following a light breakfast set up by all of yours truly, over ten mom and son teams set out to compete against one another for a $50 gift card to Bed Bath & Beyond. With Travis Kittell ’18 and his Mom Vickie Whitlock securing the win, everyone was then free to go about their day enjoying the beautiful Saturday afternoon. 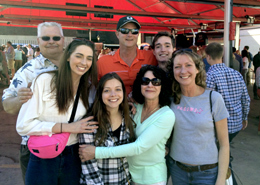 Following the tournament, many of us then brought our Moms – and even some Grandmothers – out to one of Illinois’ most beloved bar establishments, the Red Lion. Here, Moms had the opportunity to meet one another and take in one of Illinois’ most popular attractions all while enjoying some drinks together alfresco. Furthermore, the bar hosted live music entertainment (a rare occurrence) that played major decade hits all the Moms were grooving to. A good time had by all who attended, we Betas were so happy to spend some quality time with our Moms and we continually appreciate them for all that they do for us. After all, who would we be without them? Cole Senesac '18 (second from right) and his family enjoying Red Lion for Mom's Weekend. TJ Mayer '16 and Luke Mayer '18 (left and right, respectively) with their Mom Margaret and brother Jack. 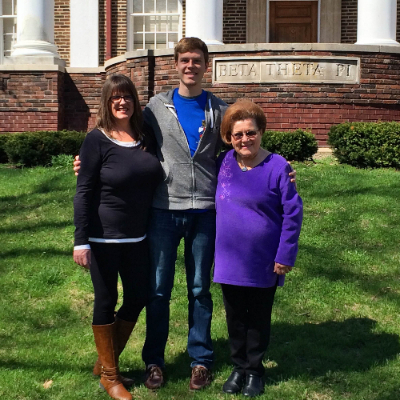 Mike Czmiel '15 with his Mom and Grandma on the House lawn for our final Illinois Mom's Weekend. By all measures, Beta Bags was a huge success! We had over 60 teams competing in the tournament that raised over $5,000 and, despite the inclement weather, participants told members of our House how great a time they had. I want to thank all the alumni who generously donated - I cannot tell you how much it means to have you involved in our philanthropy. We look forward to continuing to establish this event on campus for the coming years." With good times had by all involved and the word now out to the Illinois campus community about our philanthropy, we are already looking forward to next year when we can make the tournament bigger and better than 2015’s – perhaps even sunnier too. Escaping the rain proved to be a challenge, but Sigma Rho made it work by continuing the tournament inside. The event included friends, guests, future initiates (shout out to Ayush Singh) and sororities from all over campus! Definitely hit the mark with our first official philanthropy event. 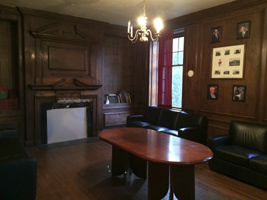 As previously highlighted in past monthly/bi-monthly updates, we Betas have always been striving to make the Chapter house one which is more inviting to alumni, their families, campus sororities and ourselves. From historic photos and library materials to the first of hopefully many campus philanthropy awards, we have always been striving to add a personal touch that can be appreciated by all. One of the most popular additions came from the suggestion of several who wanted a communal place to enjoy with the arriving warmer spring weather. 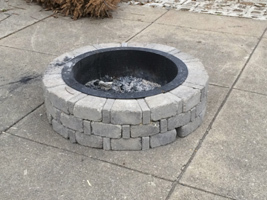 Newly constructed on the back patio by some of our own actives, we have now added a fire pit that I can honestly say has more than paid for itself in the few weeks we’ve had it. In addition, we have been intent on paying homage to our Chapter’s illustrious history in the form of paying tribute to many of our most notable alumni. The library now displays a Wall of Fame, accentuating some of the best to have come from Sigma Rho. From AT&T Wireless CEO John Zeglis to Jacksonville Jaguars owner Shahid Khan, professional NBA player Gene Vance to the (to be hung soon!) three university Chiefs John Bitzer, Michael Gonzalez and Matt Gawne, all now share a place in the Chapter library to serve as inspiration of Betas who can be great. As mentioned, we are always striving to improve the house and we welcome any of your suggestions too. 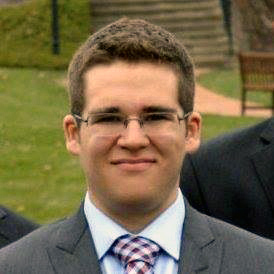 Please reach VP of Communications Aaron Reinsbach ’17 should you have an idea to share; we would greatly appreciate it! The Chapter continues to add improvements for a more inviting environment, most recently the Wall of Fame added to the library. Added out on the back patio is the latest addition, a house firepit! Next semester will definitely see it being used night after night. "I will be moving to Colorado Springs, CO to work with the Air Force Academy in athletics as a marketing coordinator where I will assist with marketing football, hockey and men's basketball. Additionally, I will serve as the marketing oversight for women's basketball and volleyball." "My favorite memory was being in Orange Krush and rushing the floor as Tyler Griffey hit a last second layup to beat number one ranked Indiana." "I will miss the people. I will miss all my brothers in Beta, my friends and all my professors and mentors that helped me be successful in college." "I joined Beta to help restart a great Chapter that will help shape young men for years to come and I can gladly say that I believe that the Sigma Rho Chapter is on its way to being great Chapter. - Kai - ." 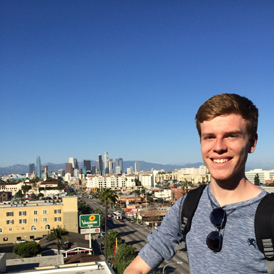 "Next year, I will be attending the University of Cincinnati to continue on to complete my Master's of Architecture. As for the summer, I will be interning with a firm somewhere within the Chicagoland area as well as taking a few trips to celebrate completing my undergraduate studies." "All the late, late night and sometimes overnight studio sessions with my peers certainly come to mind as well as having all the leadership opportunities I have held over the years (PR Chair, Student Senator, College Ambassador). Additionally, I will forever cherish the nights spent at Kams and Brothers and the subsequent 2am food runs with my friends." "Certainly being a part of Sigma Rho and seeing all my studio friends each and every day. After being with them for the past four years, it will be surreal not to have them around. Also can't forget the campustown atmosphere." "Never be afraid to put yourself out there and have some fun, but always pay attention to the small things that can trip you up. 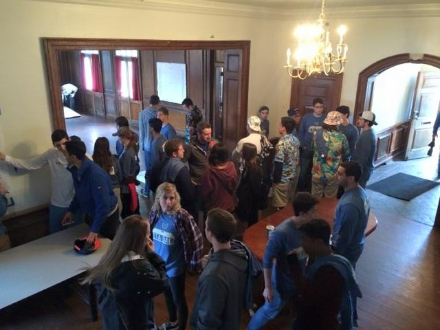 When I visit Illinois next semester, I want Sigma Rho to be even stronger than it is today." "I will be performing in the Lucerne Festival in Switzerland before moving on to Graduate school for music studies." 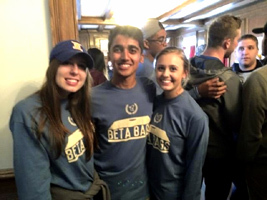 "While every Unofficial has been awesome, the Beta formal at the Sears Tower in downtown Chicago was awesome as well." "I will definitely miss my friends, the fun campus atmosphere and just overall being a U of I student." "I cannot wait to come back to campus sometime soon and I really hope that my connection to the University and to Sigma Rho remains strong." 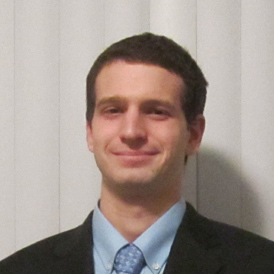 "I am interning with PricewaterhouseCoopers this summer in its State & Local Tax Dept. where I will travel to Belize to conduct financial literacy workshops for underprivileged communities. I will then be returning to UIUC next year to obtain my Master's of Accounting Science." "One of my top memories was seeing Illinois beat #1 ranked Indiana and rushing the court at Assembly Hall my sophomore year." "I will be returning thankfully; nothing to miss yet!" 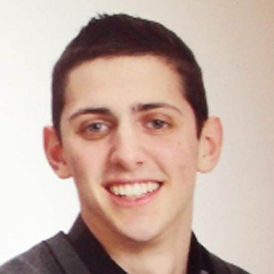 "My undergraduate experience has been exceptional due to the great individuals I've met. My best advice for college is to find the middle ground of endless work ethic and balance as this will yield the most success." - Future plans after graduation:"Though I graduate with my Bachelor's in Accountancy this weekend, I will be back in the fall for the Master's program so I am not quite ready to leave Champaign yet. 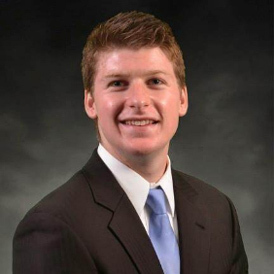 For the summer, I am interning for McGladrey, a public accounting firm in Chicago." "By far all the people I have met - I have been introduced to so many lifelong friends and genuinely good people. Of course there are also a few great memories at Kams and Red Lion but those stories are for another day." "Although I am staying another year here at UIUC, I will miss all my senior friends who are moving on and not coming back in the fall." "The University of Illinois has given me the best years of my life and I look forward to continuing my education here next year." "After graduation, I will be moving to Madison, Wisconsin to work for a medical software company called Epic Systems. Since I am graduating in three years I will be taking a gap year, but still applying to dental school this June." "My favorite memory cannot be singled down to one specific moment, but consists of the many days when my friends and I would hang out for hours knowing we had a ton of work to do, but yet found little motivation to get it done." "I will miss meeting all different kinds of people since I doubt I will ever be in a place that is as concentrated with people that are around my age." "Work hard and be studious, but do not be afraid to go out on a Wednesday night - I am convinced that it is the most fun night of the week." The last paragraph of my last newsletter now reached, I can say that there are so many thoughts racing through my mind in regards to completing my time at both Sigma Rho and the university. When this opportunity came along a few years back and I had made the decision to be a part of it, I remember being told by many that I was soon to become just a part of the larger negative stereotypes that can be associated with Greek life. Refusing to believe this, I set out to impact this Chapter by giving it and my Brothers the talent I possess for writing to bring you news and updates about what we had been up to. In turn, this impact was meant to exemplify to you – parents, alumni, actives, etc. – that we were more than just another campus fraternity and that what we were re-establishing here was on the right track for future brothers to come. Along the way, the position became more personal to me as I could see how much it was appreciated by everyone despite my frequent badgering for information or the academic interruptions that kept me from getting these out sooner than later. It was always such a great pleasure to hear from my Brothers that recipients were enjoying reading up on us and it is a job that I will dearly miss having once I graduate. So to my parents, fellow Sigma Rho Brothers, families and alumni, I sincerely thank you for allowing me the opportunity that gave me multitudes more than I anticipated – it truly was a privilege. Though my time at Illinois is coming to a close, I’ll always be an Illini and Sigma Rho Beta for life. And that, to me, truly is one of the greatest honors. Enjoy the upcoming weekend and summer! 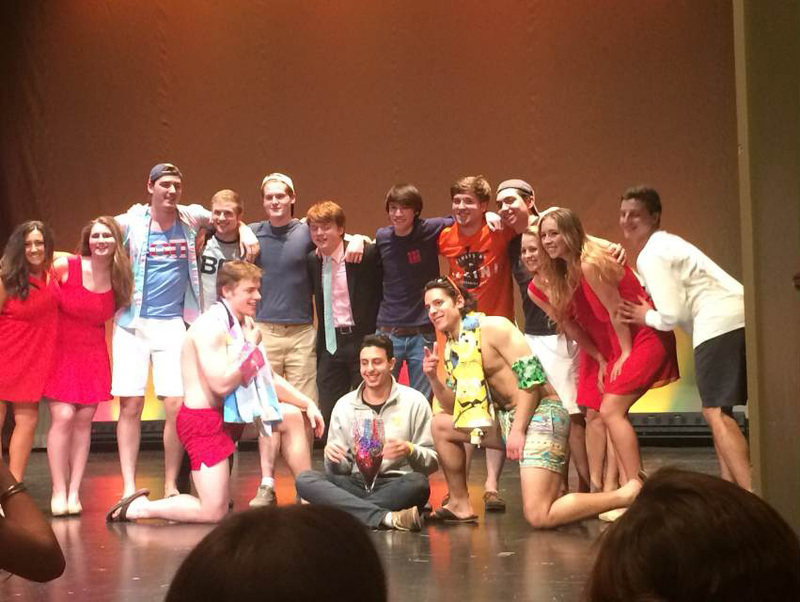 Copyright © 2015 Illinois Beta Theta Pi, All rights reserved. 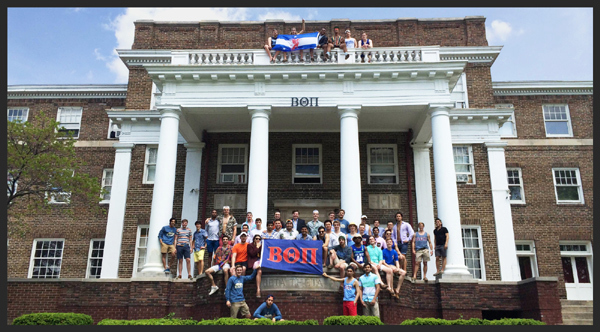 This is the official parents newsletter of the Sigma Rho chapter of Beta Theta Pi.